Paul Durcan, ‘Life is a Dream; 40 Years Reading Poems 1967-2007’, Harvill Secker 2009. Life is ordinary. It’s full of ordinary everyday activities like working with colleagues, food shopping, walking around your neighbourhood, going to sleep and waking up….right? When someone points out the humanity in these activities to you, as corny as it sounds, you begin to live on a higher level. This is what Paul Durcan’s latest anthology of poetry does. 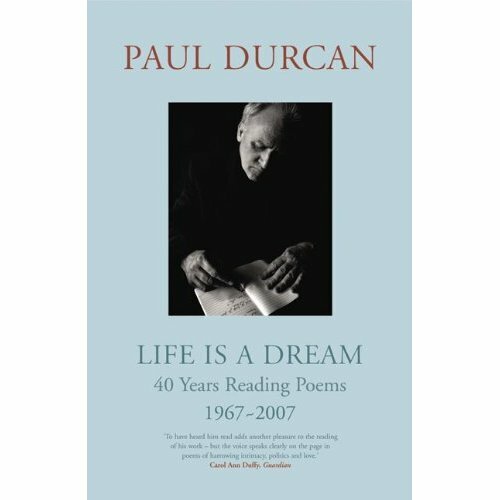 It is a representative collection of Paul Durcan’s life’s work of poetry from 1967-2007. Paul’s poems conjure ordinary scenes and with ordinary language reveal the majesty that resides in even the smallest of human interactions. Sometimes poignant sometimes witty and humorous the poems are always accessible even to those, like me, who aren’t seasoned poetry readers. The underlying tension when a neighbour calls to visit, the dreamy requests of a sleepy child to a father, the poignancy of the absence of an ill colleague from work, the faltering of a heart when a marriage begins a demise…why are these majestic? because Paul Durcan not once fails to observe the breath of life in everyday interactions even when it is faint. Take a break from fiction and treat yourself to some short and razor sharp insights into the human condition. Life is not ordinary….life surely is a dream.